Our goal is to provide you with the best, most accurate, and thorough diagnosis possible. Fortunately, recent technological breakthroughs have allowed us to make major advances in our ability to achieve that goal. Cone Beam Computed Tomography (CBCT) (“dental cone beam” or “cone beam”) is a new technology similar to CAT scans in that it will give us a 360 degree 3 dimensional view of the area we are examining. Previously, we were limited by dental X-rays, even digital dental X-rays, to a two dimensional picture of a three dimensional problem. There were many things we could not see because X-rays did not have the resolution to show them. Despite our best efforts, we were forced to infer, project, surmise, calculate, and interpret. Often, we could only give our best educated guess based on what we could see on the X-ray. Additionally, X-rays were often just not sensitive enough to show very small or beginning problems. That has all changed significantly with the advent of the dental cone beam technology. With its extremely high resolution and exceptionally low radiation, it has literally changed our world with respect to what we can now see. Taking the image is as simple as sitting still. The scan will take less than 18 seconds and the images are transferred directly to a computer. 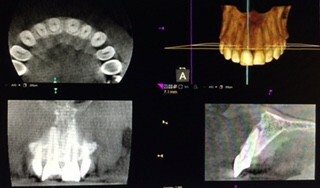 A common question about 3D imaging is the amount of radiation that is emitted in obtaining this type of image. In an effort to provide the best care and lowest radiation dose possible, we selected the CS9000 3D Extraoral Imaging System by Carestream. This machine offers extremely low radiation exposure. We tend to be on the conservative side, so only if it is necessary or if you have a referral for a CBCT, will we take a cone beam image. Faster and safer Since CBCT captures images in a single rotation, scan time is quicker than that of traditional spiral CT systems. Plus, since radiation doses are relative to the size of the FOV selected, practitioners can reduce the amount of radiation to which patients are exposed while focusing on particular regions of interest. Greater accuracy Comprised of 3D cuboid structures known as voxels, the volumetric data set sent to the imaging software allows dentists to render 3D images that can be manipulated to show certain tissues, view different angles, and display varying thicknesses and depths. 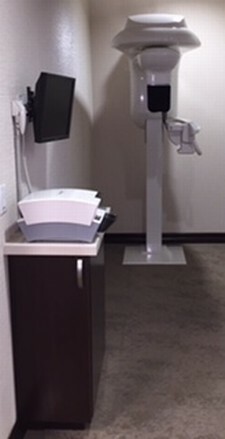 Versatility Not to be limited by their own advancements, CBCT systems can be used for traditional forms of radiography, including cephalometric, panoramic and 2D imaging. This not only provides dental practitioners with additional diagnostic tools, but also makes the transition to 3D imaging easier for dental assistants and other staff. Greater patient comfort and improved education On top of the peace of mind provided by lower radiation dosages, CBCT systems are manufactured specifically with increased patient comfort in mind. This means less restrictive positioning and more open environments with plenty of space. Also, the ability to provide patients with full 3D renderings of their condition illustrates problems in a visual manner, allowing them to play a larger, more collaborative role in their own treatment.